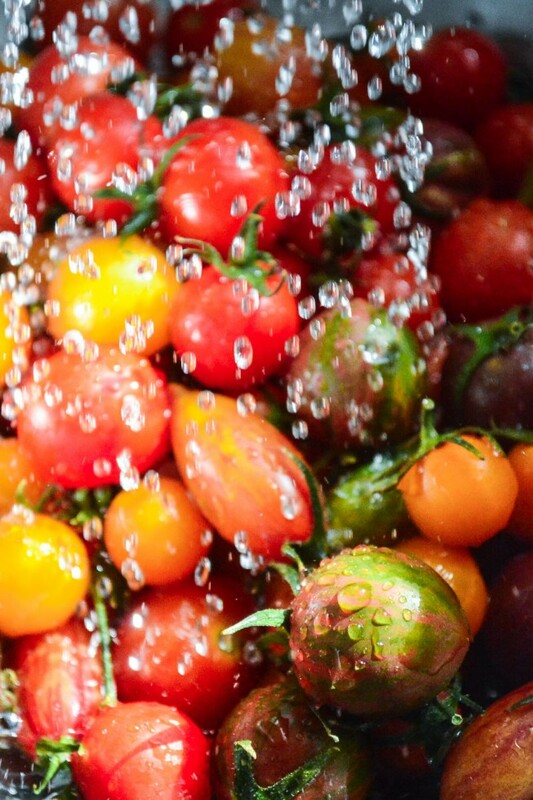 It’s high summer, tomatoes are at their peak, and the grill can be fired up at a moment’s notice. 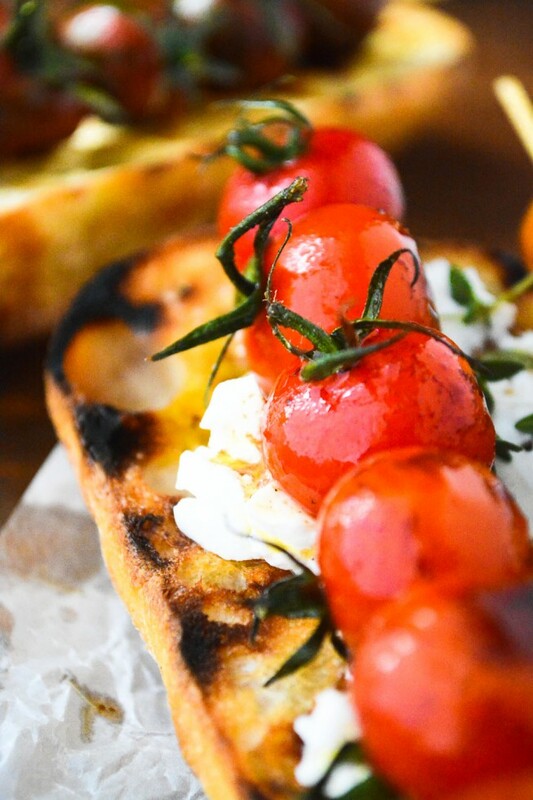 Grilled Cherry Tomato Bruschetta is a delicious way to take advantage of all that. I saw the idea on Todd and Diane’s blog, White on Rice Couple. 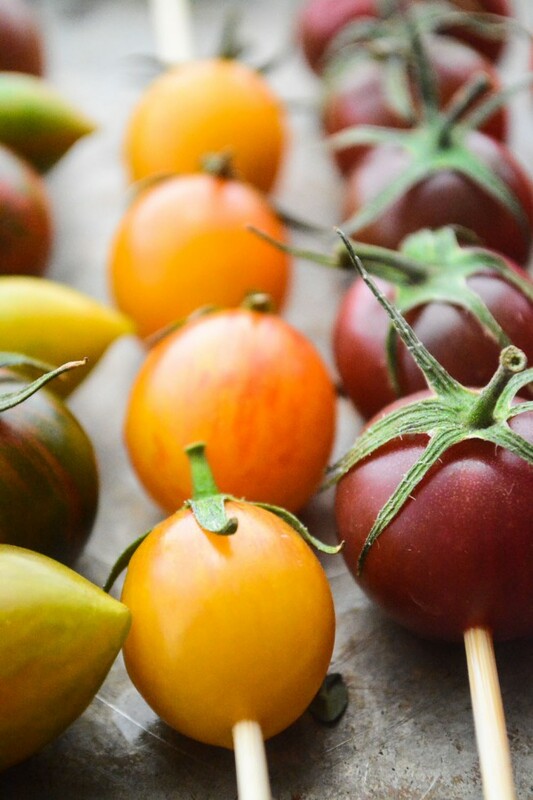 They were celebrating a bumper crop of their own backyard tomatoes…I got mine at the farmers market, but the result is the same in either case — I got a little carried away scooping up these colorful beauties and I now need to eat them up at every meal. Not a bad problem to have. I think cherry tomatoes are the best tomatoes. They have fantastic flavor, and they hold their own when you cook them. 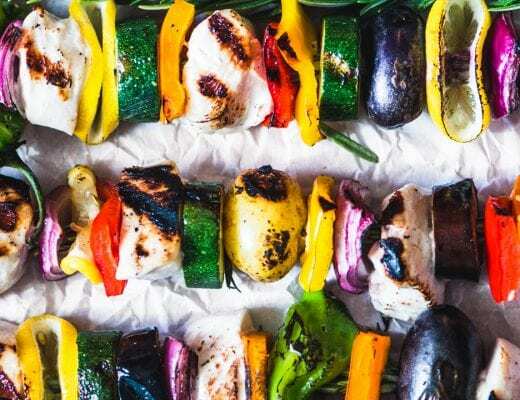 They might sputter and spit when they hit the hot grill, and might burst a seam or two, but basically they hold together, and get even more flavorful as they heat up. 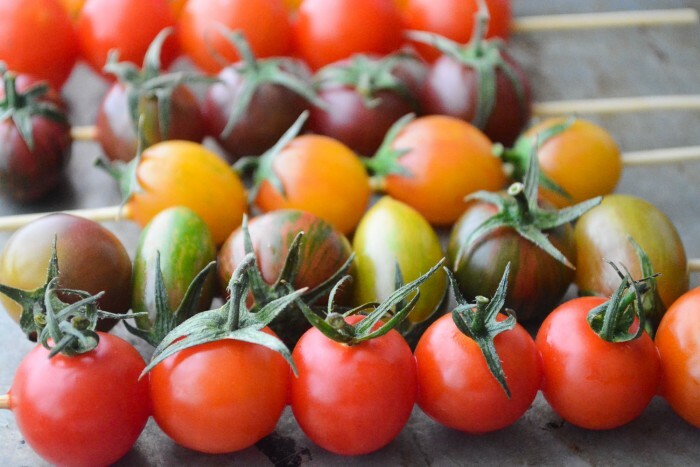 My favorites are the little heirlooms, at our farmers market they come in all shapes and colors. Each one has a distinctive flavor, too. They’re insanely good for snacking, and for scattering on salads, but if you can bear to save any for this dish, you’ll be glad you did. 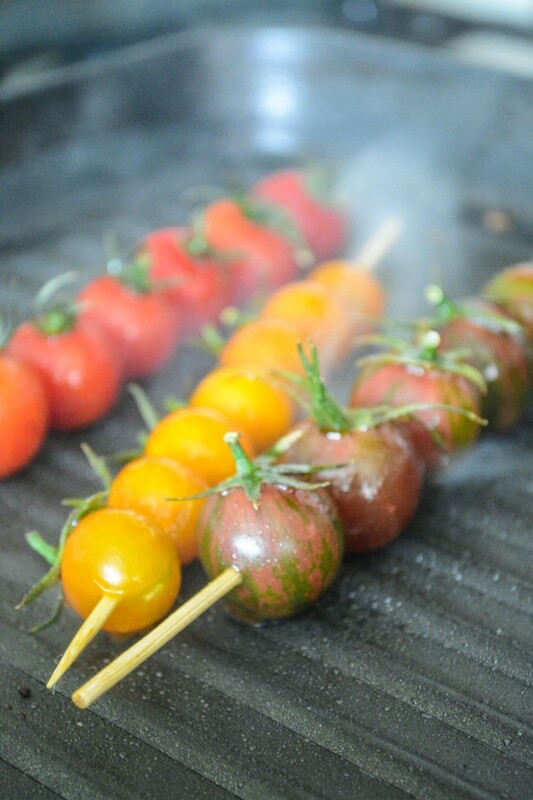 Just thread the tomatoes on slim bamboo skewers…mine were 8 inches long and quite thin, almost like long toothpicks. Heavier skewers will be too thick for tiny cherries. I kept the little tops on for fun, but you probably want to remove them, they look pretty but don’t taste good. A quick brushing with a good olive oil and vinegar marinade is all they need. They cook up in a flash, I do mine in a grill pan on the stove. Leave them just until they get get a little color – it takes hardly any time at all for them to soften to perfection. For the bread I use a small 12″ baguette and cut it in half. Then I slice each half lengthwise to form 4 flat pieces, each about 6 inches long. I brush them with olive oil and grill them for just a minute or so, until they get nice grill marks. 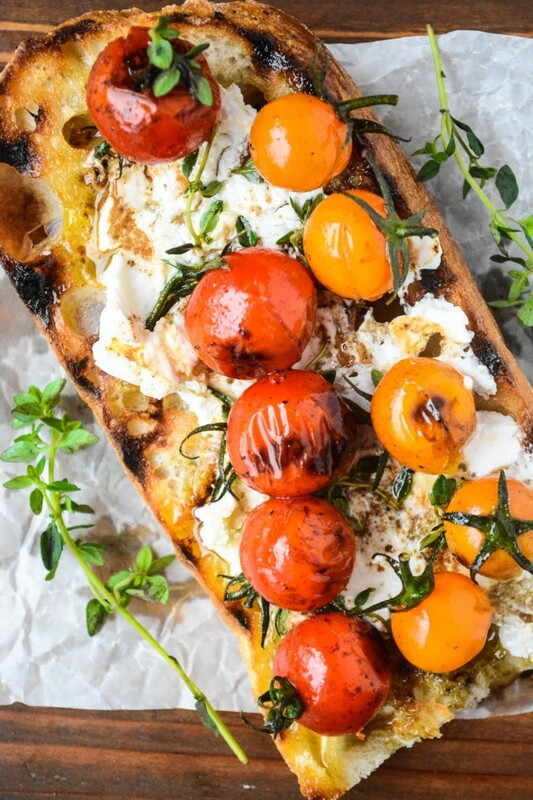 The grilled bread gets slathered with a soft, fresh goat cheese. Any type will do, but I have fallen head over heels for this brand. It’s got a texture like nothing else I’ve ever tasted, and it spreads beautifully. I’m thinking about adding some prosciutto next time and making a complete meal out of it. 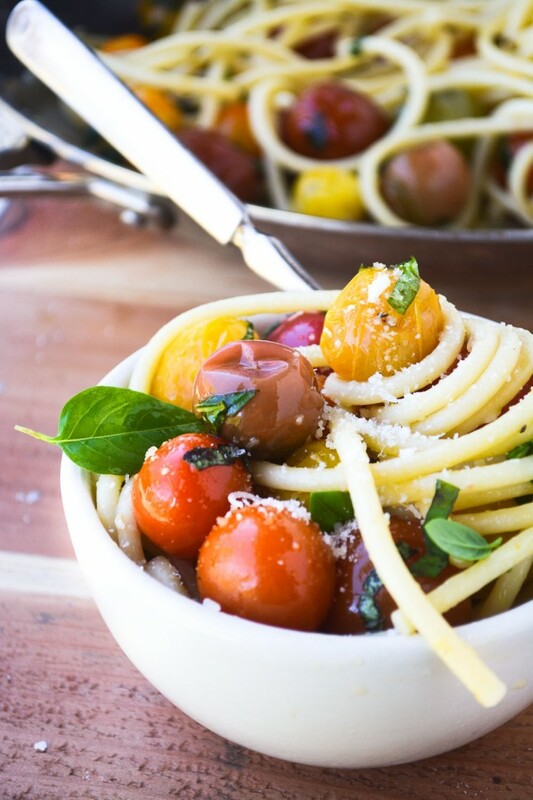 Thread cherry tomatoes onto the bamboo skewers and set aside. Leave space at one end so you can handle them. 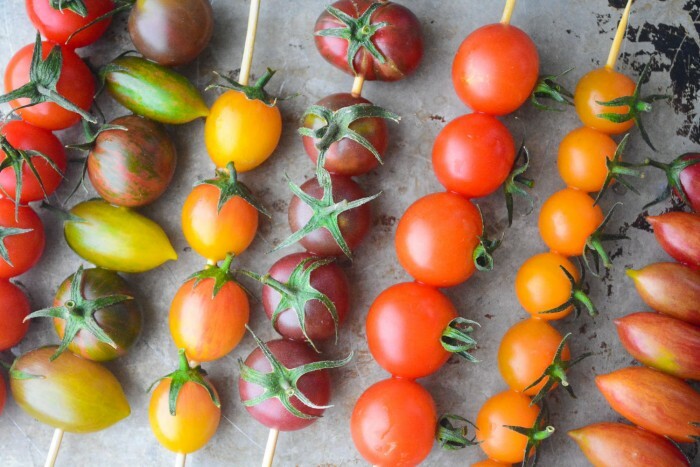 Depending on the size of your tomatoes you might need 6 or 7 per skewer. Less if you are using larger cherry tomatoes. Blend the olive oil and vinegar together in a small jar. Taste to adjust the proportions if you like. Cut the baguette in half, and then slice each half lengthwise. Heat a grill pan over medium high heat until hot. Brush the cut side of each baguette with olive oil and place cut side down on the grill to toast. It won't take long, leave them just long enough to get nice grill marks. I like to press the bread down with a spatula to make good contact with the grill. Remove and set aside. 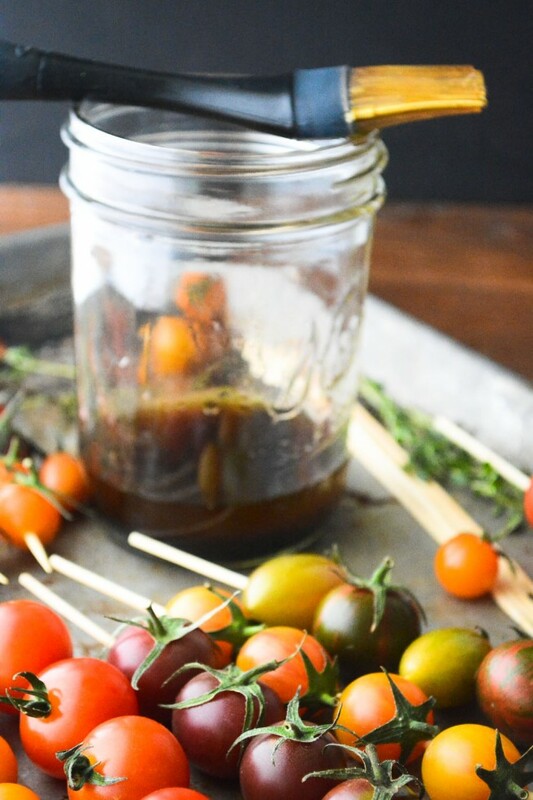 Brush the tomato skewers with the marinade, and place them down on the hot grill. Let them cook for just a minute or two, rolling the skewer occasionally to cook them evenly, until they start to char and blister just a bit. 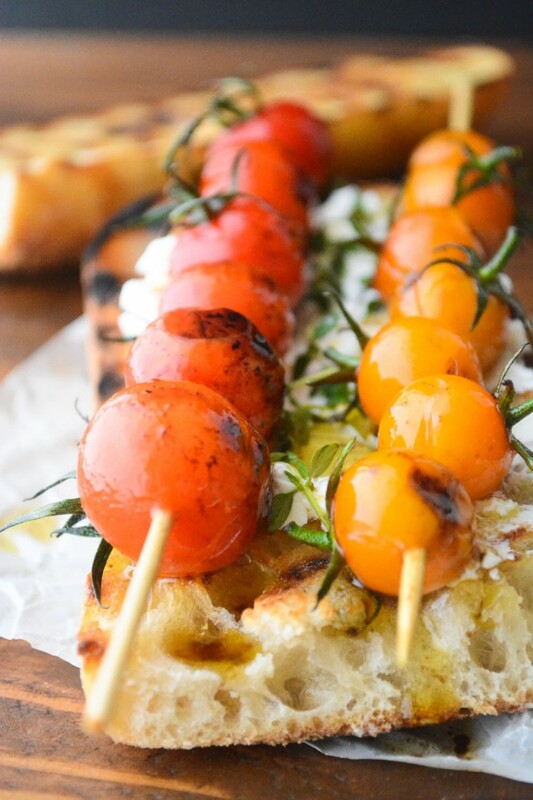 Spread the goat cheese thickly on each piece of bread, and top with the tomatoes from two skewers. 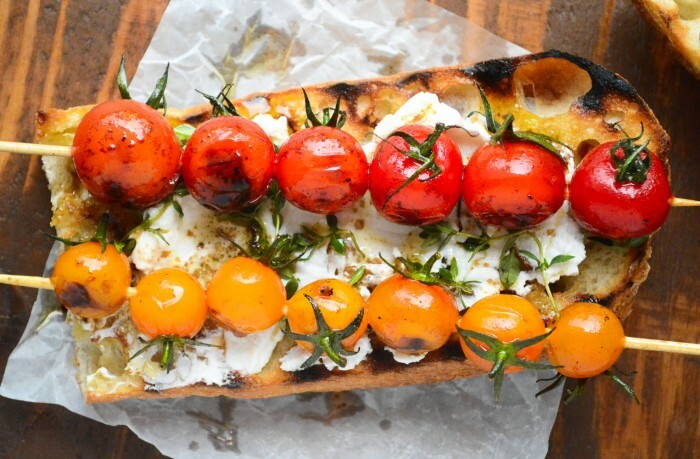 Gently slide the tomatoes off onto the bread. Drizzle with a little more marinade, and scatter with fresh thyme. Enjoy immediately. 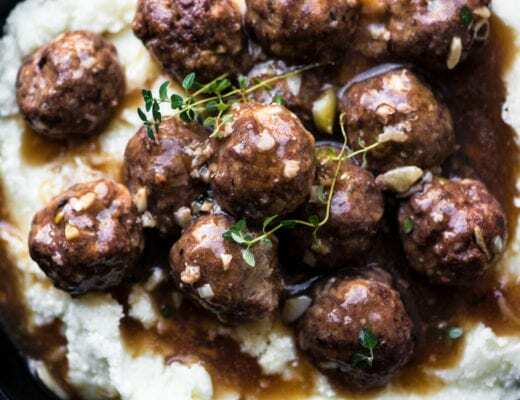 Another amazing recipe! Tried this tonight but used grape tomatoes as they were what we had available, and grilled them on the BBQ. Paired it with an herbed goat cheese and it was soooo good. I mean simple, but aren’t the best recipes sometimes like that?? 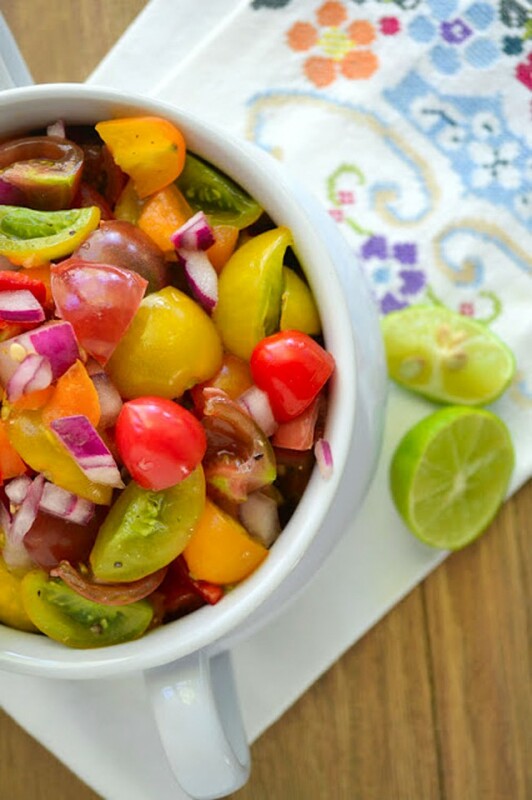 We will definitely make this a staple this summer and are keen to try it on a pizza. Thanks! Sue. I can’t tell you how good this sounds to me right now! This is what I want for breakfast, lunch and dinner today! Bursting with color and deliciousness! I can’t wait for my cherry tomatoes to start ripening – it’s been a cool summer so far here in Wisconsin. What an amazing farmers’ market you must have! 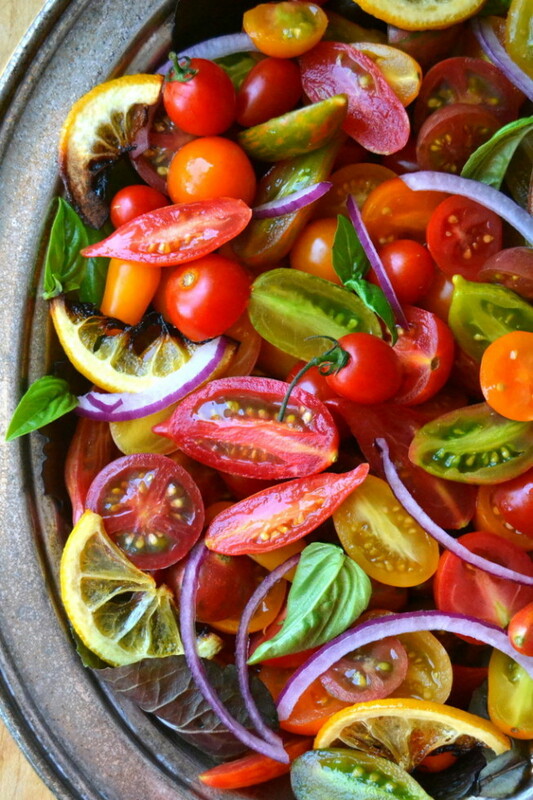 Gorgeous tomatoes and bruschetta! a fine way to celebrate tomatoes, of which we have plenty! beautiful display, sue! Goodness. 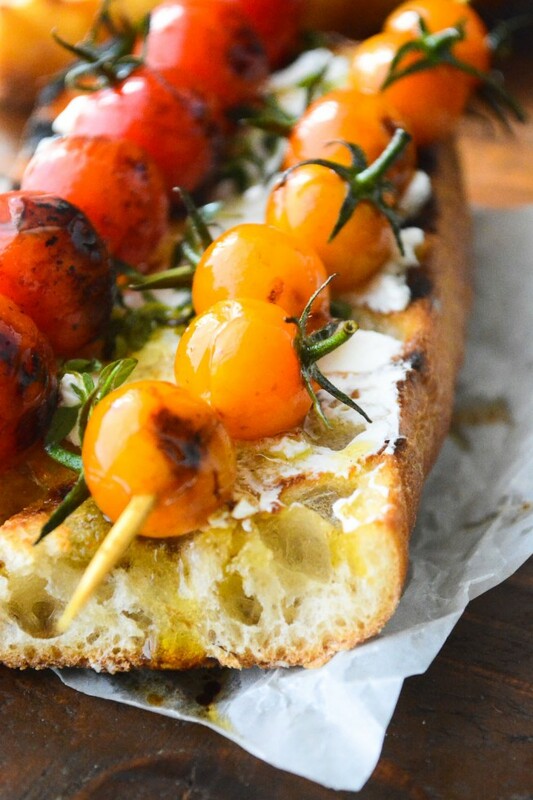 Those bruschetta look amazing with all those fresh colourful tomatoes. Our tomato season has not hit yet for the summer but I too love the mini heirlooms. Grilling them brings out such wonderful flavor too! 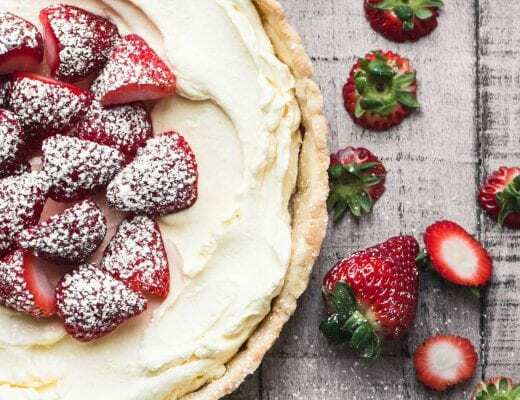 This recipe is gorgeous Sue! Destined to a be a summer fave. Every summer I say I could live on bruschetta, and it’s true – to me it’s one of the most satisfying appetizers/snacks/light meals on earth. Sometimes I use fresh tomatoes, other times I sauté them, but I’ve never tried grilling them. You just solved what to make for dinner tonight ;). Pinned! I’ve pinned these to make next week when my herd arrives from London. I know they will love them. So simple but so perfectly “summer”! Sue this is gorgeous. I bet the tang of the goat cheese just really sets off the sweetness of the tomatoes. 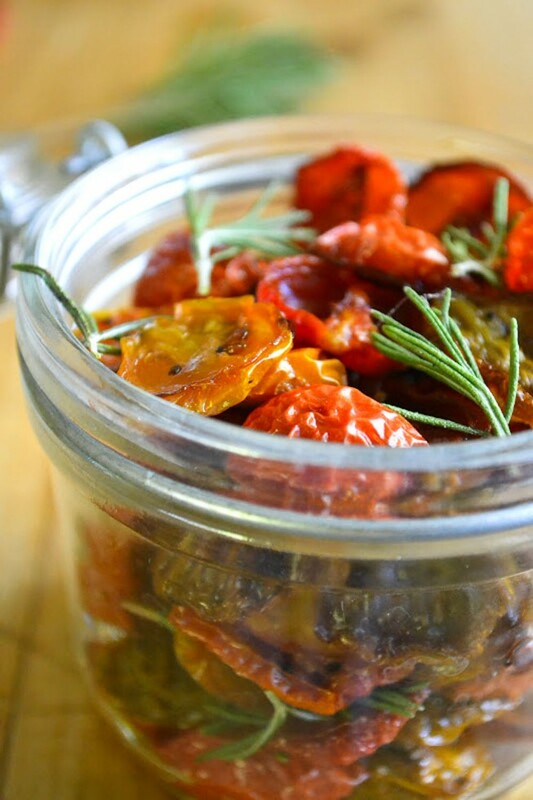 Love the photos and still want to make all your other tomato recipes :) We should start a recipe club and make each others recipes once a month! That way I’ll get to try more of your delicious posts!